How to Root Galaxy S3 on Mac OSX/Linux/Ubuntu! [Jelly Bean] U.S./Canadian ~ AndroidRootz.com | Source for Android Rooting, ROMS, Tricks and More! Have a Windows computer? 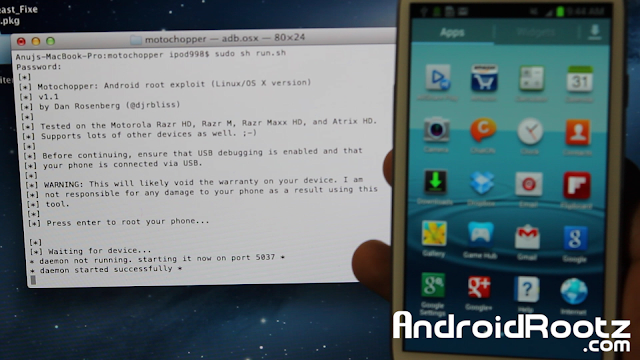 Click here to root any Galaxy S3 on Windows! Please DO NOT try this on the international GT-i9300 Galaxy S3!! This method will ONLY work for U.S. and Canadian Galaxy S3 Variants! That includes T-Mobile SGH-T999, AT&T SGH-i747, Verizon SCH-i535, Sprint SPH-L710, U.S Cellular, and any Canadian Galaxy S3! This guide will root your Galaxy S3 on any Mac OSX/Linux/Ubuntu computer. Why would you want to root your tablet? Rooting will allow you to get full access to your tablet. It gives you "admin" control for everything on your phone so nothing is unrestricted to the user. If you are coming from an Apple product it's like jailbreaking except 100x better! 1. Turn on USB debugging. Go into "Settings" > "Developer Options" > Check Mark "USB debugging". If you don't see developer options then go into the "More" tab then "About device" tap on build number about 10 times until it says "You are now a developer" and then go back and you should have USB debugging. 2. Plug in your phone via microUSB and the other end to the USB port of your computer. 3. Download the motochopper file using the link below and move it to your desktop!